In cooperation with the Asthma Clinic at the Centre mère-enfant (CME) of Centre hospitalier universitaire de Québec (CHUQ) [the mother-child centre at the Québec university hospital centre], and with the consent of the families involved, the research team recruited 115 children from ages 3 to 12. For an entire year, these potential candidates were followed and different tools were used to assess their indoor home environments. One hundred and eleven (111) children completed the observation period. At the end of the first phase, 83 participants (75%) living in homes with low levels of ventilation were selected to participate in the randomized study. In June 2010, the participants in the intervention group (n=43) and the control group (n=40) were assigned randomly. The intervention to improve ventilation took place in the homes of the intervention group during the summer and at the beginning of fall. All study parameters were re-assessed during the second observation year. From the very start, a fairly high percentage (65%) of the single family homes evaluated during the study were already equipped with a mechanical ventilation system (MVS), usually a heat recovery ventilator (HRV). This represents almost double the proportion reported among the general population. The quality of indoor air was generally good in most of the homes when compared to average concentrations of several traditional contaminants: mite allergens, mold spores, fine particles (PM2,5) and nitrogen dioxide (NO2), for example. A significant proportion (30%) of these homes presented mean formaldehyde concentrations that exceeded the guideline of 50 µg/m3 for 8 hours recommended by Health Canada to prevent respiratory symptoms in asthmatic children. A high proportion (70%) of the homes presented a ventilation rate below 0.30 air changes per hour, the nominal ventilation rate recommended in the National Building Code of Canada (NBC) and the Construction Code of Québec (CCQ). The professional installation and use of a MVS such as a heat recovery ventilator (HRV) or an energy recovery ventilator (ERV) significantly improved the ventilation rate and indoor air quality in the homes of the intervention group, compared to the control group, and totally controlled guideline excesses for formaldehyde during the fall and winter. During the fall and winter following the ventilation intervention, the researchers observed no significant decrease in the number of days of asthma symptoms among children in the intervention group compared to the control group. However, compared to the control group, they did observe a significant decrease of 22% in the proportion of children in the intervention group having experienced one or more episodes of wheezing, and 20% for children having had four or more episodes during the following 12 months. 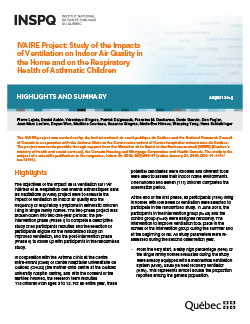 On the basis of the difference of risk observed between the two groups, it was estimated that the ventilation intervention carried out in five homes in the study sample prevented formaldehyde from exceeding the guideline of 50 µg/m3 for 8 hours in a home and prevented one or more episodes of wheezing affecting an asthmatic child during the year. Given the small size of the sample and limits of the study, a study with a larger number of participants would be advisable.